(File System Checks) on startup, pull the formatter board and change the battery. The formatter board has the printer's hard drive and IC board. It is where the power cord plugs in (as well as LAN cable and USB cable.) It's held in place with two screws - just loosen and pull the board straight up out of its socket. Best to blow board off with canned air or bulb. 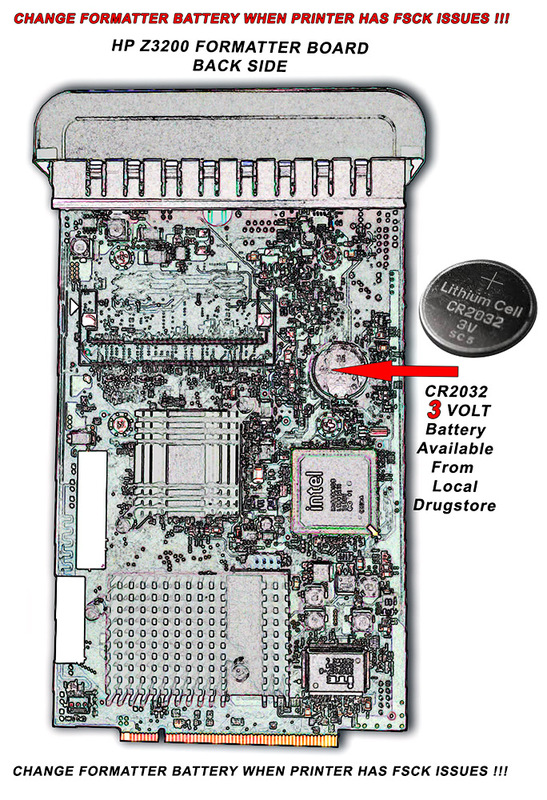 The side opposite the hard drive has the battery which is a Lithium CR2032 available locally at most drugstores. (Known as a watch or camera battery). ALWAYS check the battery - best to replace it, if weird things are happening with the printer. Very often this is a MIRACLE FIX for the Z3200 Series Printer !!! DO NOT replace faulty Formatter/Hard Drive Combinations with USED formatters and Hard Disk Drives. Once the formatter is installed, the software residing on the hard drive looks for and incorporates the serial number, model number (ID) and password from the printer and cannot be transferred to another Designjet Z3200 printer. Don't buy USED formatters and hard drives from eBay. Buy only OEM models and they must correspond to your printer: either Rev .A or Rev B. Look on the sticker on the back of your printer to find your model number. It should read Q6791A - meaning Rev A model, or Q6971B- meaning Rev. B model. 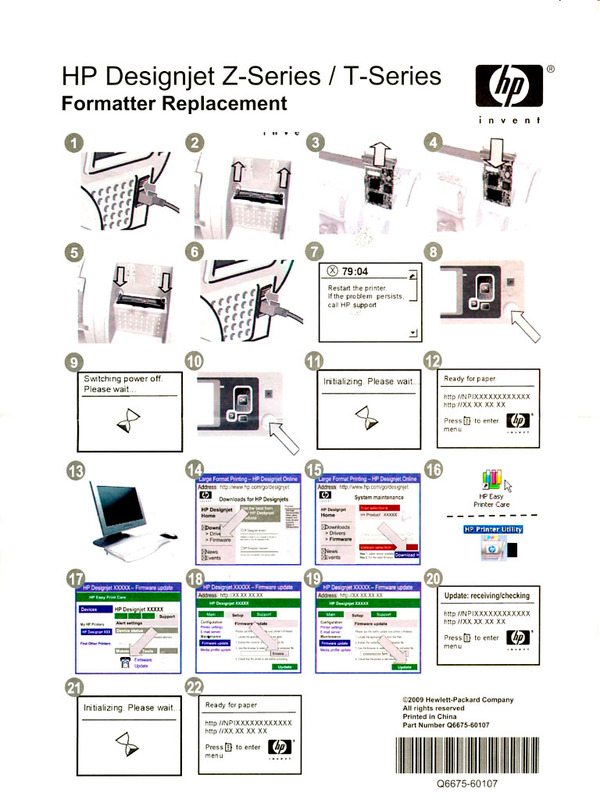 Formatter Board and Hard Drive Replacement Instructions. (step 8) and turn it back on (step 10). Printer should then initialize. I leave the firmware that is loaded on the hard drive first and try it. If it works well, I leave it. I can always upgrade the firmware, but can't go back without having an archived copy of the firmware to go back to.